EntroPay is a convenient and reliable payment solution which was launched in 2003. It is the first prepaid card of this type in Europe which shows the innovative spirit of the company and its intentions to improve the way the online payments are carried out. In order to encourage people to try out and use its virtual cards and to show them that paying online is no longer risky or insecure, the company has made sure that its products are highly protected, efficient and reliable. Ever since its foundation, its main priority has been to create an online payment solution that will be both convenient and straightforward. It is no secret that there are still many players who are reluctant to make deposits online as they fear that their sensitive information might be exposed. However, this prevents them from the unique opportunity to play in an online casino at the comfort of their home and save time and efforts. EntroPay has proven to provide secure and reliable online payment solutions which give such uncertain players the chance to change their mind and adapt to the fast growing world by trying its services. EntroPay belongs to Ixaris Systems Ltd. group which is under the regulation of the Financial Conduct Authority. One of the company’s first priorities is to assure high level of protection for its customers and this is the reason why it has a cutting-edge security system. This makes it impossible for any third parties to get information regarding the correspondence or the activity between the users and the company. By using EntroPay, players have the chance to take advantage of any of the virtual VISA cards the company offers. It is worth noting that all of them are prepaid cards which can be used for paying online securely in any website that accepts VISA. This enables players to safely arrange payments online due to the fact that there is no need to provide sensitive information such as their credit card details. This type of VISA makes the process of spending money online more straightforward and easy to conduct. It is extremely convenient for players as thanks to it, they will be able to make a deposit online quickly and proceed to more pleasant activities such as playing their favourite casino game. Loading funds to any of the virtual VISA cards is just as easy as paying online. All that is needed is to simply create an account, sign in and choose the most preferred deposit method. The customers can easily transfer funds directly from another card or their bank account to their virtual card. When they select any of the above mentioned options, they have to insert the exact amount of the deposit and the funds will be added to the virtual VISA card instantly. It is worth noting that they will be required to double check the amount of their deposit once again and confirm it as these are the standard security procedures. Once the funds are added, it is possible to pay online quickly and securely. Thanks to EntroPay and the online casinos, players have the opportunity to not only play whenever and wherever they want, but also to successfully make a deposit regardless of their location and time. They can arrange payments instantly and have the needed peace of mind that their sensitive information is highly secured at any point. All of the virtual VISA cards give customers the chance to withdraw money securely and conveniently. In order to do so, there is one requirement that should be met. Users can withdraw money on the condition that their last deposit was made no longer than six months. If they comply with this requirement, they will be able to receive their requested amount of money within a short period of time. This is extremely beneficial for players as whenever they get lucky in their favourite online casino, they will be able to get their winnings in a timely manner. EntroPay customers don’t have to pay any interest fees or any charges if they have surpassed the set limit. However, it is worth noting that only certain procedures such as online purchases or card delivery, don’t require fees. 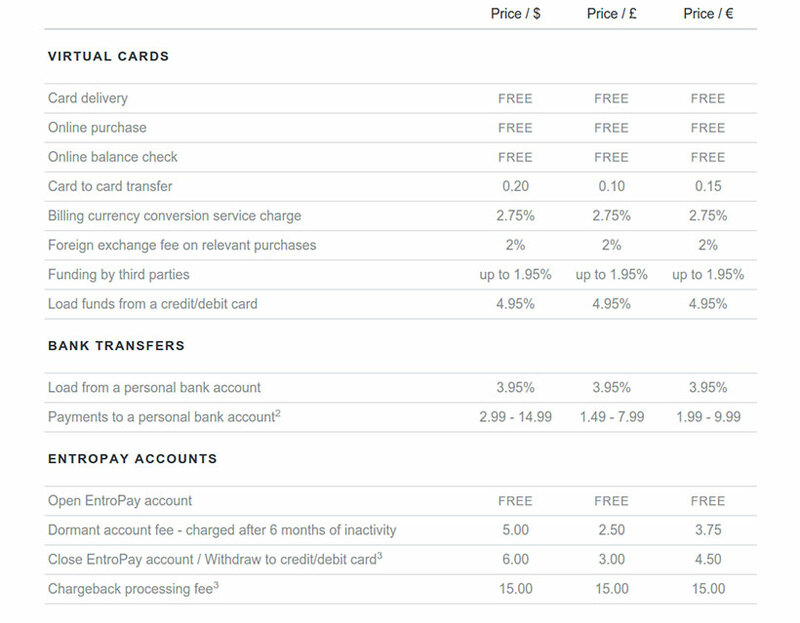 For instance, there is a charge of £0.10 when players transfer money from one card to another. Also in case they would like to load their virtual cards with money from their Debit or Credit card, the charge is 4.95%. Some more services that are not free include funding made by a third party, billing currency conversion and others. This is the reason why it is best to get familiar with the company’s policy regarding the exact fees and charges in order to avoid any misunderstandings. EntroPay provides virtual VISA cards which have a number of special features and advantages. Due to the virtual nature of the cards and that everything is arranged online from creating the cards to the actual payment process, they can be considered as extremely flexible and convenient. All of the cards can be managed extremely easily as it is possible to delete or edit them with a single click. They can be created in the following currencies GBP, USD and EUR which enable its customers to choose the most preferred for them one. Furthermore, the users of the virtual VISA cards have the chance to withdraw and receive money from any part of the world. They can even do so, without having a bank account which significantly saves them efforts and time as there is no need for any additional procedures. EntroPay cards are suitable for making deposits in online casinos which make them perfect for gaming activities. Thanks to EntroPay, people have the chance to pay online securely and easily in their preferred currency. With the prepaid virtual VISA cards, they save time and efforts due to the fact that they can deposit and withdraw money quickly. They are especially convenient for online players because of the many benefits they offer such as high level of protection, flexibility and efficiency. It is now possible for them to fund an online casino account in a swift manner and enjoy a favourite casino game at the comfort of their home. I have been a long-time user of EntroPay and I would like to share my experience with you. EntroPay is one of the best services to utilise at online casinos since it offers complete anonymity and quick transactions. Deposits and withdrawals are carried out in a timely manner. There are some charges when you load money onto your card, but those are only 5% or so. Since EntroPay virtual cards are issued by Visa you can use them anywhere that Visa is accepted. Overall, EntroPay is an excellent service that I can wholeheartedly recommend. With EntroPay you can have all the benefits of a Visa prepaid card without having to get up from your desk. EntroPay offers users virtual cards issued by Visa, which you can use everywhere that Visa is accepted. This includes online shops, Internet services, as well as online casinos. There is hardly an online casino out there that does not accept Visa cards as a payment method. I personally have used the service many times at different casinos. The transaction times are just like with your standard Visa card, deposits are instant, while withdrawals take a few days to process. The main disadvantage of this service is that you have to pay some fees, though they are rather low. If you were ever anxious about sharing your personal information when making deposits to online casinos then consider using EntroPay. This service provides you with a virtual Visa card that can be used as a gateway between your bank account and the casino. This card behaves like your regular Visa card but it only exists on the Internet. Your anonymity is guaranteed when using this service. An advantage of this card is that it is prepaid and you can only spend as much as you have loaded on it, meaning that you can’t accidentally spend a month’s salary at once. The only gripe I really have with EntroPay is with the customer service team. They can be less than helpful when you actually need them. My issue did get resolved in the end, though it took way longer than it should have. EntroPay is an online payment solution which offers users virtual prepaid cards. Since the cards are issued by Visa users can pay with them anywhere where Visa is accepted. Such places include online casinos, where I have used this service numerous times to make deposits and receive withdrawals. Transactions are carried out in the same manner with a physical Visa, deposits are instant, while withdrawals take up to several business days to process. Using EntroPay is free for the most part, though charging your virtual card will impose some fees. By using this service you can guarantee that no sensitive data will be made available to anyone.